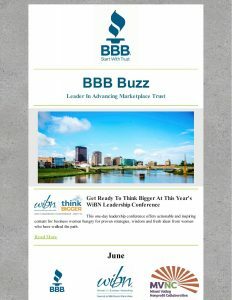 Your Better Business Bureau has teamed up with Lamar Advertising Co., LLC to offer BBB Accredited Businesses and Charities the opportunity to partner with your BBB on electronic billboads located in the Miami Valley. It’s a quick, easy way to keep your name in front of your potential customers featuring a timeless message. Your BBB does all the work for you. Businesses are required to participate for three month (12 weeks) term. Your ad will rotate between the three billboard locations during each three month term. Each ad will be shown for eight seconds before the next ad is displayed in rotation. It will be displayed 555+ times per day. The billboard message will be the same as above. As a participant, your logo, Web site and phone number will be featured in the white box. A great way to maximize your Accreditation and enhance your credibility in our community. friendly, successful and most importantly, reasonable priced. I am a 5 year veteran of billboard campaigns in both the Cincinnati and Dayton areas and I can tell you they are pricey. Being able to share this BBB digital billboard space with other accredited BBB businesses at such an affordable rate is something I just can’t pass up. This is why I have committed to this project for the past several campaigns AND I have signed up for the next one. Thank you for providing me with this excellent opportunity. We would like to recognize the Dayton BBB and its electronic billboard campaign program in which we recently participated. Without the BBB we would not have been able to participate in this sophisticated marketing opportunity. Working with Kristen Clark and Sheri Sword we were able to put together a billboard advertisement which was attractive, easy to read and which concisely conveyed our services. We consistently find our local BBB staff supportive and easy to work with. We appreciate the assistance they consistently provide. Wanted to thank you for your professionalism, and quick response on getting my business name up and running on the billboards campaign with Lamar. I was very impressed with the response time and everything was done by email. We’ve even gotten some calls already from the ads. We plan on signing up again for a new campaign. 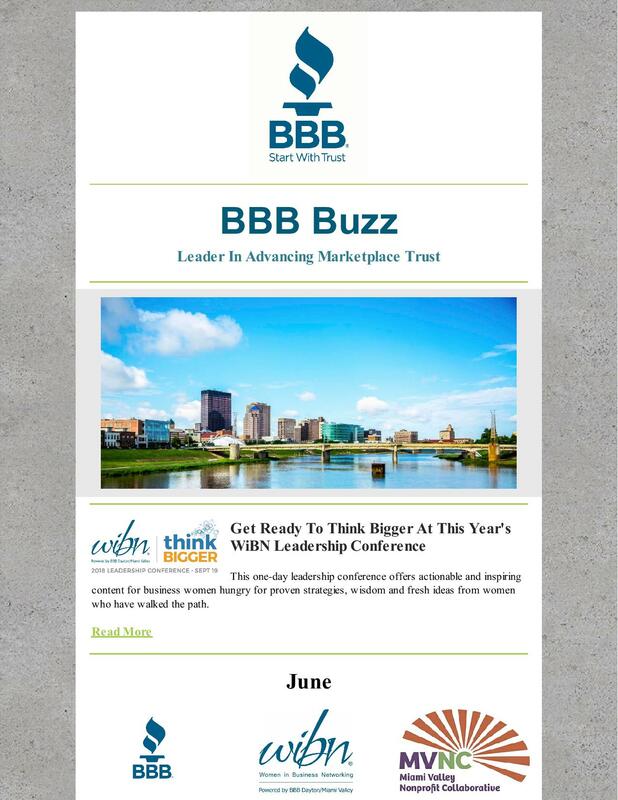 Advertise in your BBB’s monthly newsletter, BBB Buzz. It’s sent to business owners and upper level managers of over 3,000 Accredited Businesses and Charities and their staff. 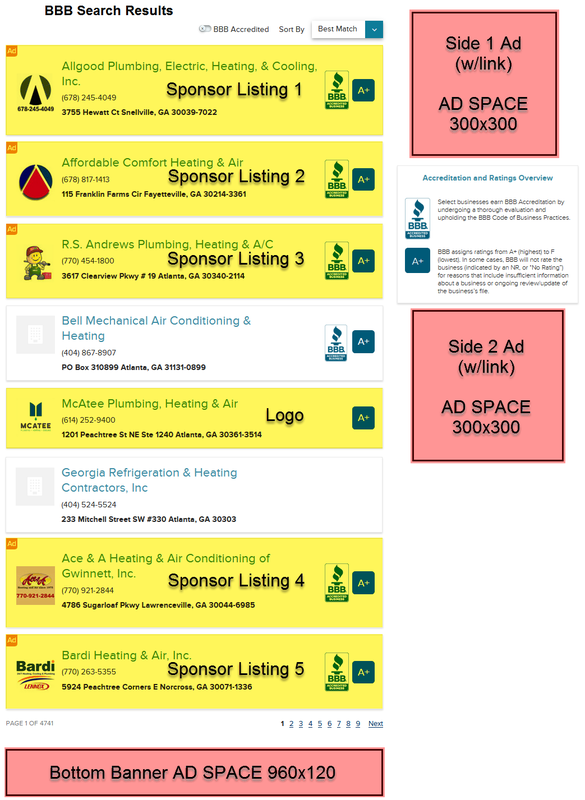 The sponsorship puts your logo on each page of the monthly newsletter. Readers can click on it to go to your business review to learn more about your company and link to your Web site. Need more information? Contact Shelagh McGovern, 937-610-2275, smcgovern@dayton.bbb.org to learn more. Your BBB has worked diligently to dramatically improve its visibility in local online search results. In fact, so far in any given month, BBB listings show up on first page Google results over 400,000 times for people in the Miami Valley looking for the types of products and services our Accredited Businesses provide. To help you benefit from this increase in traffic, we’re offering the opportunity for your company to on our Accredited Business List for your industry. This sponsorship program highlights your company. Example: Welcome to your BBB’s 24-hour information service. This free service is made possible by BBB Accredited Businesses and is sponsored in part by [your company name]. Call us at 000-0000 to assist you with all of your home improvement needs.